What happens if Santa gets sick on Christmas Eve? 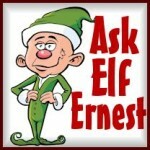 That’s a really good question and, honestly, it is one we ask and worry about all the time here at the North Pole. We have discussed it many times with Mrs. Claus. As you might imagine, Mrs. Claus is very protective of Santa. She makes sure he eats right and stays healthy. If he ever shows even a sign of the slightest sniffles she makes him visit Elf Dr. Lionel and puts him right to bed. Santa is very healthy. And he only rarely catches even a cold. He’s amazing. But he is human. He has a back up plan in case he gets sick. It would take someone really special to do what Santa does if Santa can’t do it. And the only one who could possibly pull that off would be Mrs. Claus. Of course, she would have a lot of elves and reindeer to help her. Do elves ever pee themselves? Do elves have normal jobs like policemen? What do elves get paid? That question was posed on “Who Wants to be a Miillionare” several years ago. The correct answer was the Easter Bunny.